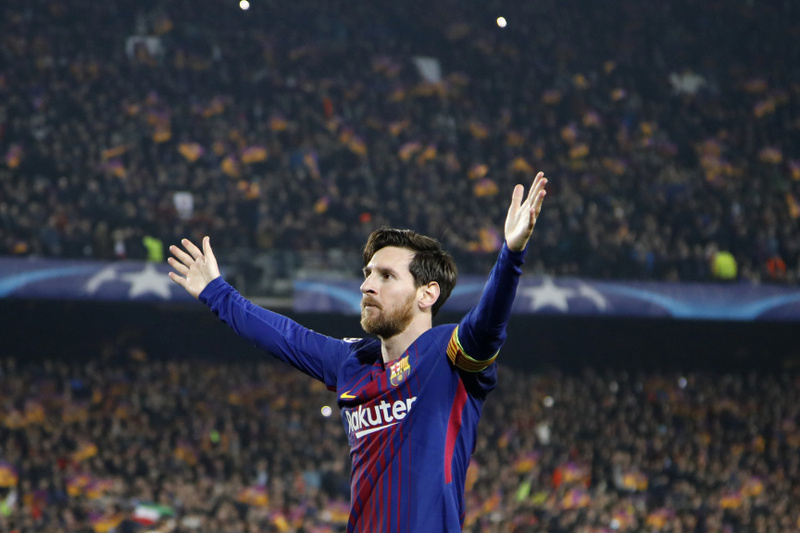 BARCELONA, Spain (AP) — Lionel Messi joined Cristiano Ronaldo in the Champions League's 100-goal club after scoring twice to lead Barcelona past Chelsea and into the Champions League quarterfinals for an 11th straight season on Wednesday. Messi also set up Ousmane Dembele in a 3-0 win at Camp Nou after he had scored Barcelona's goal in the opening-leg 1-1 draw in London. Messi beat Thibaut Courtois with two strikes between the Chelsea goalkeeper's legs from very tight angles on the side of the box. He struck the opener three minutes into the match and took Barcelona's third goal in the 63rd. Ronaldo, with 117 goals, is the only other player to reach the century-mark in Europe's elite club competition. Messi reached his 100th goal in 123 matches, while Real Madrid's star needed 144 games. While Chelsea coach Antonio Conte lamented his players' near misses — they hit the woodwork four times over the two legs — he lavished praise on Messi, whom he congratulated on the pitch following the final whistle. "I think when you have the opportunity to make a great compliment to Messi, it is right to recognize a super, super, super top player," Conte said. "We are talking about an extraordinary player. The best in the world. This type of player is born once in 50 years." Also on Wednesday, Bayern Munich won 3-1 at Besiktas to advance 8-1 on aggregate. Conte looked to repeat the team's relative success at frustrating Barcelona's attack from the first leg with its back line of five defenders. But Messi needed very little to poke a hole in Chelsea's wall. The Argentine forward targeted the only gap available: the slot in-between the legs of Courtois. "We know that we can always count on him," Barcelona coach Ernesto Valverde said. "It goes with his character and the responsibility he feels for the team." That ability to know exactly what his teammates need was clear when Messi swooped in to steal the ball from Fabregas in midfield and charged toward the box. Instead of passing to Suarez, he let the striker draw the remaining defenders to him, and then passed across for the unmarked Dembele to drive a rising shot over Courtois. It was Dembele's first goal for Barcelona in his 12th appearance for the club and could represent a breakthrough for the 20-year-old France winger, who had been hesitant and error-prone in his previous games after recovering from two injuries since his move from Borussia Dortmund that could reach 147 million euros (about $173 million). Antonio Rudiger came closest to a consolation goal for Chelsea, but his header hit the crossbar in the 90th minute, adding more near misses to Willian's two shots off the woodwork from the first leg.